Worldwide Shipping. Ships usually within 2 days. An excellent receipe for dull, dry and chapped lips. 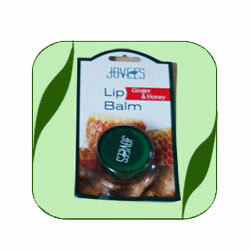 Jovees Lip Balm offers complete Lip Care with a specially developed formula that contains pure almond and olive extracts along with natural Vitamin A, B, C and E. This unique formula soothes and conditions the delicate lip area, restores mositure and brings shine and happiness to the lips. An excellent recipe for dull, dry and chapped lips. Smoothen on lips, apply as often as needed. Online since 2000. COMMERCE INDIA, 320, NSR Road, Saibaba Colony, Coimbatore 641011, India. Phone:+91-422-2439319. © Copyright 2018 mall.coimbatore.com. All Rights Reserved.